Listen to the live audio recording. 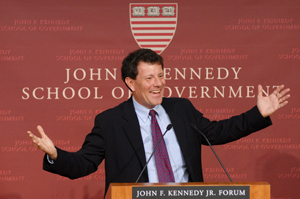 Speech as delivered by Nicholas Kristof at Class Day for the Kennedy School of Government Commencement. Thank you. Thank you very much. Well I’m happy and actually a little relieved to see a full house given the competition across the street there. Caroline and I, my daughter Caroline and I, was actually just returned back from China and so as I was walking over here I told her you know that Bill Clinton is speaking right over there and you may actually be the only member of the audience. But then there was actually this thoughtful pause and then Caroline said, “Um, Daddy, can I go hear Bill Clinton?” So it really is a great relief that I have anybody here at all. First of all, let me offer my congratulations to the graduates as they say the tassel is worth the hassle and that’s true I guess even if you don’t actually have a tassel. And now that you’re all newly-minted graduates, I want to start off by asking you a question and hear your advice in handling a situation that arose for me when I first moved to China as the Beijing Bureau Chief for the New York Times years ago. When I arrived I’d studied Chinese language and you know I was pretty confident about my really understanding the language and culture. I was prepared, I felt arrogantly confident in a way that only journalists can, I suppose. My predecessor in the New York Times in this apartment the New York Times always used pointed to a cubbyhole in the wall covered in a grate and he said that that was where the bugs were. So a little later I was hanging a picture near there and I was on my ladder and I thought, “Well I’m going to get to the bottom of this.” So I took a hammer, I knocked down the grate, and sure enough, in this little cubby hole, way up there by the ceiling, there was all this electronic gadgetry and I looked at it and I recognized the Chinese characters and I was so proud of myself and impressed with my Chinese because they read “electronic sound carrying device.” Okay, well, I had found the bug. So my wife and I retreated to the bathroom and we turned on the shower and the faucet and flushed the toilet non-stop and we consulted about what we could do. And this is what I want to get your advice on. One option is just to be well behaved and leave them there, leave them intact. Option two is to destroy them. Option three is to leave them there and use them to feed disinformation to the Chinese security forces. So now I want to put all of you on the spot and not just the graduates but everybody here, you all have to choose one of those three options, okay—leave them intact, destroy them, or use them to feed disinformation. How many of you would do kind of the proper or maybe prissy thing and leave them intact? [laughter] This is a law-abiding audience I see. Okay, um, how many of you would destroy them? And how many of you would use them to feed disinformation to the Chinese security forces? [laughter] I’m just gonna take a few names down and uh, I think I can sell that to the Chinese state security. Well, as my wife and I were there in the bathroom consulting about what to do, a friend arrived at the front door and we found out what an electronic sound carrying device is in Chinese: it’s a doorbell buzzer. Well, that was deflating but in a very, very useful way. It was a reminder that education in anything—language or anything else—is an essential preparation for the real world but that education obviously continues thereafter. And also that one of the best preparations we can have for life, for that real world out there, is a good dose of humility. Well, one way of getting that dose of humility and to continue your education is to live abroad for a time, or at least to travel widely outside your comfort zone. And I say that partly because I think that one of the lessons that we in the U.S. have learned over the last few years is that many of the mistakes that we have made—and I think not the least of those is the invasion of Iraq—came in part because there weren’t enough Americans who really understood the world at a grassroots level. The most remarkable intelligence failure (after 9/11, after all) didn’t actually involve WMD. Rather, it was the assumption that Iraqis were going to welcome us with flowers. And I think that if more college graduates of my generation had actually traveled abroad and had engaged the world and had sipped coffee in coffee shops throughout the Arab world and elsewhere around the world then I don’t think that we would have made that mistake. Often the most important way you get that understanding of a foreign society is through that grassroots view that Beck talked about and not a satellite image. We can have intelligence experts who have studied a foreign language in the classroom and who know how to say “surface-to-air missile” in a bunch of different languages but I have my own language test that I always apply to somebody when I’m trying to gage how much they understand a foreign society. And the essence of that is a single question: “How do you say ‘doorknob’ in that foreign language?” I see a bunch of you sort of thinking “En français? Le door knob? La port knob?” but it’s the kind of thing you don’t necessarily learn in class but that if somebody does know how to say doorknob in a foreign language then it’s a pretty good bet that they may indeed have something useful to say—some reasonable judgments—about that foreign society. And, in addition, I think only by traveling around the world—and ideally embedding yourself in it—do you really gain that empathy and can you shake off that numbness that has allowed us to look the other way as 30,000 people die every day around the world as a consequence of poverty. That 30,000 people who die daily, that is the equivalent of a Virginia Tech shooting every 90 seconds. The challenge though is not only to generate some chalk about that and to retain some idealism about how to respond to it, but also essentially to figure out how precisely to make a difference. When I graduated from Harvard College, I was among the hoards who wanted to give the commencement speech (and I was one of the hoards who was unsuccessful in that, I should add) but almost all of us who competed to give the student speech essentially wanted to give the same speech, and it was about the importance of keeping idealism as we went out into the real world. And the fact is that actually since then as I have spent more time abroad, I’ve really become a bit more skeptical about idealism, pure and simple—about simply idealism. And a part of that was living in China and seeing the consequences of Communist and Maoist idealism. A lot of very good people there had quite nobly pursued ideas about equality, about sharing property, and the result had been catastrophe. Or, to take another example that may perhaps offend some of you, I think that the anti-sweatshop and anti-globalization movement has also suffered at times from an excess of idealism. In the early 1990s, to take just one example, there was a really noble effort to bar imports of sweatshops and on the ground in Bangladesh that led the garment factories there to dismiss tens of thousands of kids who were working in those sweatshops and they didn’t have any better options, and particularly for the girls, a vast number of them ended up in brothels, in Dhaka, and perhaps now are dead of AIDS. The problem is that idealism unless it is really anchored to empiricism, to a real knowledge of local conditions, often just doesn’t make great policy. Many of those who supported the Iraq war were, I think they were idealists of a fashion, in some cases, but they didn’t understand how an invasion would go over in the Arab world, the response that it would get, and they discounted their critics. But don’t get me wrong, look, we need idealism, and we certainly need a moral compass and moral outrage, but it’s so important that idealism and that outrage be tethered to pragmatism and empiricism. It needs to be based on a really deep familiarity of the local circumstances—with a sense of how we can actually, in the nitty-gritty, improve peoples’ lives—and not just about symbolism. Now, in Africa to take one example, there has been a huge effort to reduce mother to child transmission of HIV, using drugs like Nevirapine, and the problem has been that you simply have a clinic that administers that and then afterward hands out infant formula to prevent the mother from then infecting the infant from breast milk, but then you walk a hundred meters down the road and you see all this formula that has been discarded by the side of the road by these new mothers as they walk home. And the essential problem is, which few people had really thought of ahead of time, is that in the village any mother who doesn’t nurse her child and who uses formula is immediately suspected as having AIDS and there’s a huge stigma to that. So the challenge isn’t just to try to bring in the right drugs, to direct resources at a problem, but it’s also to have the local experience and the savvy to figure out how most effectively we can accomplish our objectives. Well the good news is that I think more and more young people are marrying that idealism with precisely that pragmatism. I think that there are more and more young people who want to save the world, at least part-time, and I welcome that as, you know, we need more part-time actors as well as full-time ones. I think that there are also much better tools to do that today. We baby-boomers were idealistic but not often, not always very effective in what we did. Our reflexive notion about how to save the world was to hold a street demonstration, a protest, and in some cases that worked very well; in others, it really didn’t. These days there are I think a lot more people who are motivated by idealistic goals but also have a lot of very practical tools about how to make that difference. Instead of just demonstrating against poverty, they may start an after school literacy program, or they’ll organize a clinic in a low-income area, or a micro credit program. They’ll use metrics every step of the way to see what is making a difference, what is the most cost-effective way of doing so. So, in other words, if you want to make a difference, then I think we have a much better understanding today than we did a generation ago, about how precisely to do that. Take this place; in my freshman year at the college, there were an awful lot of protests about the Kennedy School and about its initial plans to name the library here the Engelhard library after Charles Engelhard, a South African industrialist. And there was tremendous energy that went into those protests, they disrupted the inauguration of this facility, and yet at the end of the day if the challenge was how do you help African parents educate their children, how do you get more people bed nets to reduce malaria, or how you get a better crop, then by those standards, that effort didn’t accomplish all that much. And in contrast today, there is a new effort that I think actually does get more bang for the buck if you will. That’s an effort, it’s a group of alumni, called the Harvard Alumni for Social Action, HASA, and it isn’t about symbolism, but about addressing real needs. One of the most urgent needs across Africa has been precisely the lack of people with advanced degrees and so the effort of HASA is to build connections between Harvard and Africa and African Universities, bring more students to Harvard, and enrich this university but also really make a tremendous difference by bringing more professionalism and higher skill level to developing countries. Likewise, at tomorrow’s commencement, we’re going to hear from Bill Gates, and I think that, while the emphasis has always been on the money that he’s been applying to philanthropy, there’s something else that he’s done that is very important, and that has been precisely bringing a real business sensibility to measure the impact, to figure out the best way, of fighting poverty and infections abroad. And all across the world, you’re seeing an explosion in the number of social entrepreneurs. And certainly Darfur and the rise of the Save Darfur movement is an example of that. One of my own favorites involves a man in Nigeria, in Lagos, who recognized that one of the big problems in developing countries is a lack of sanitation. So instead of just lobbying for more public toilets, he started a franchise system for very cheap, pay washrooms that are just circulated in poor areas of Lagos, and they have dramatically increased sanitation all through the city. This very scalable model is now being applied to other cities in the developing world. So for those of you who are graduating from the K school, I really hope that you will tackle some of these great humanitarian challenges. There are so many out there. You know from reading my columns some of my own passions there aside from Darfur. They include human trafficking, maternal mortality, generally, the role of women in the developing world, which I think is the paramount moral challenge of this century, equivalent to totalitarianism in the twentieth century or the fight against slavery in the nineteenth century, but there are a million other challenges that desperately need more attention. And here at this school you have picked up so many of the tools that really will allow you to make so much more of a difference on them. And I also think it’s important to recognize that it’s not just a matter of doing good abroad—helping other people—you also really do benefit enormously yourself. I got a call the other day, Dave Rubenstein, the head of the Save Darfur movement, just left his job, and I had a call from him, and he mentioned that it is the best single thing that has happened to him in his life was taking stewardship of that movement, and you know in the process I think he’s also helped to save countless thousands of Darfuris. But there’s really also something in it for you as well. You come to see your own life and neighborhood in very different ways when you have engaged with other problems around the world. And let me leave you with a story of an American friend who came back home from a sojourn abroad and she looked at a birdfeeder, a simple birdfeeder in a backyard, and she fell apart. And let me tell you how that happened. My friend, that young woman, is an aid worker in Africa, in Darfur, and while she was in Darfur she saw things that no human being should ever have to see. And in particular there was a period when she was working in an area when the Janjaweed was still active. It was very hard of course to get the Darfuris to tell their stories with the Janjaweed still in that area but finally she was able to get two sisters aside and to tell their story. And the sisters told how the Janjaweed had arrived, had moved into that family’s compound (there were about fifty of the Janjaweed) and they had forced that family in effect to be their slaves—to get water for them, to get firewood for them, to cook for them, to kill their animals to feed them, and, in the case of these two sisters, to sleep with them. And the two sisters said that finally, their father, after being in complete anguish about this, had gone to the commander of the Janjaweed, and had gone down on his knees, and had begged the man, and had said, “Look, all the rest of us will do anything you want, but just please let my daughters go.” And then, the commander had called in the two girls as well, and had beheaded their father in front of them. And this was happening in an area where aid workers could reach and much worse things were happening in areas that were beyond our reach. My friend asked these two sisters, “What can we do? You know we have plastic sheeting, we have food, what can we do?” And they just came saying, “We just want to die, there’s nothing you can do.” So she came back here on a vacation, on Christmas vacation, and she went back to the family home, and she was in the backyard, and she saw that birdfeeder, and that was when she broke into tears, and just collapsed. Back in Darfur she had seen so much human energy going to destroy villages, to kill people, and here people had had the time and the leisure and the resources and the stability to put together a little bird feeder so that birds could have a better winter. And that thought and those experiences that she’d had in Darfur just made her see all of that completely differently and she fell apart. So even that kind of a simple thing that we see every day can look so different when you have been to hell and back, when you’ve tried to engage all these problems that are out there. So to you, graduates, congratulations [laughter] you can please go party this week, but after you have partied then go out and engage the world and do your best to save it. Worry about all kinds of things that you think you can’t possibly change, and then bit-by-bit at least sometimes you’ll find that you really can change them and improve them and make some difference. Camus said that we can’t create a world in which there are no children being tortured, but we can create a world in which there are fewer children being tortured. And that is the challenge, and it’s one that you guys, with the tools that you have learned here, are tremendously well prepared for. And gradually, out there, you’re going to acquire that wisdom, and that empathy, and compassion, and education that will I hope make you someday fall apart at the sight of something like a birdfeeder. Thank you very much.